Imagine what your life and career would be like without any public speaking anxiety. Yes, having an anxiety free presentations are possible. If you practice the following formula you can terminate your body’s stress response on the spot, the moment it happens. This method is best used in the heat of the moment when you first start to experience speaking anxiety or fear. The basic idea is that your response when doing a presentation (whether it is anxiety, fear, panic, joy, love or confidence), is dependent on an event (like people’s behavior, and facial expression, eyes) and how you interpret those events. If you negatively understand the events, you will get a negative response, and if you positively interpret the events, you will get a positive response, and if you neutrally interpret the events, then you will, of course, get a neutral response. What do fearful people do? 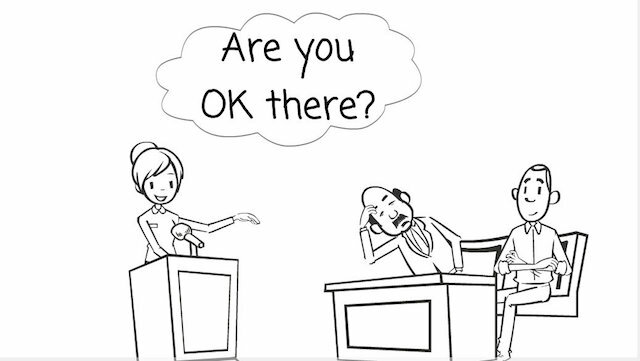 Individuals who respond with fear and anxiety while presenting, tend to take environmental events and interpret them in the worst possible way. 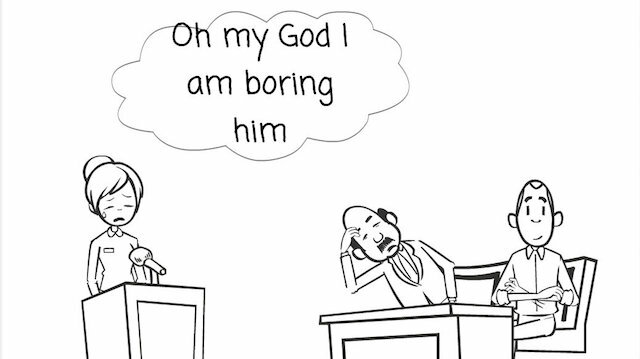 What does it mean to you if one of your listeners during a presentation falls asleep? – You might think that you are boring. – You might believe that the topic is not interesting. If you are like most people, then you will tend to give the most negative interpretation possible. 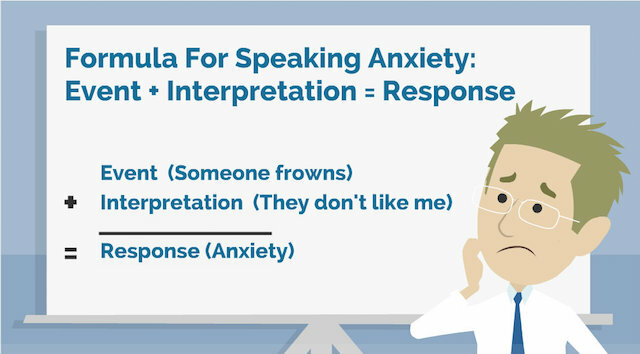 It is by far the biggest contributor to speaking anxiety during presentations. If you accept the first negative interpretation that comes to mind, you will get in trouble. What do confident speakers do? Confident speakers understand that they can’t control the events. However, they know that they can monitor their interpretation of these events. Confident speakers always take responsibility for how they feel. They never say that another person caused them to feel a certain way. If they feel angry, sad, or fearful, they always take responsibility and admit to themselves that they created that response. Sure, they might not be responsible for events that happen, but they are entirely responsible for how they respond to those events. Learning to take responsibility for how you react emotionally, physically and mentally to situations and events has tremendous benefits, not only for your public speaking ability but your life and career in general. It is usually a big topic I address with one-on-one clients and has a tremendous impact on their careers, finances, and relationships. Since you can’t control external events, you have to control your understanding of the events to monitor your response. Be balanced with your interpretations: Counter every negative interpretation with a positive one. One interpretation might be that you are boring. The real counter might be because the person is tired. Just counter with a positive interpretation for each negative one. Since you don’t know if the negative interpretation is correct, then it’s safe to say that the positive interpretation is equally possible. So many times during my early days as a speaker, I assumed someone’s state of mind, and I was proven wrong. One time I assumed that because a man was frowning as he looked at me during a presentation, that he disapproved of what I was saying. Of course, that made me angry, fearful and anxious. Soon he moved to another seat and said that there was too much light coming from the window next to him and could not see me well earlier. The moment he explained himself, I felt relieved and stupid at the same time. If I had known the balanced strategy, I would have used it to avoid feeling anxious and fearful. My favorite way to deal with interpretations is to prevent going down the rabbit hole of arguments altogether. When my brain interprets a behavior (good or bad), I tell myself that this is just one interpretation of many possible interpretations. Most of the time, this allows me to move on without having the negative fear response. Over the years, this particular technique helped me build a buffer zone between my audience’s behavior and my reaction. The area of separation helps me not to overreact when an audience member does something that implies disinterest, disbelief or disrespect (the three deadly D’s). The buffer zone gives me time to let it go before it affects my state. One time I was conducting training for a company in San Francisco. There were 35 people in my audience, and the event was broadcasted to three other virtual locations (New York, Utah, and India). Everything was going well, and people were smiling, laughing, and interacting with me. Except for one person: she was nodding off. Yes, sleeping in my training. Just like anyone else, my first interpretation was that I was boring her to death. Luckily I know better, and as soon as I heard the negative interpretation in my mind, I chose to ignore it and let it go. Honestly, I had no idea what was happening with that lady. She might have been tired, sick and she might have even been bored – who knows. I did not want to check-in with her at the time because everyone else was engaged. The training went fabulous, and I was asked to train again at that organization. I still don’t know what was wrong with that lady, and that’s ok. Sometimes it is useful to verify interpretations. If someone has a blank look, instead of just assuming that you were not clear, ask her if what you said made sense. If she says “yes,” then move on. If she says no, then ask more questions or re-explain if appropriate. The Scientific Strategy works because you don’t have to spend the rest of your presentation worrying. Just like a scientist, you create a hypothesis and seek to prove or disprove it. Unfortunately, you can’t overuse the Scientific Strategy, because if you have to check on every environmental trigger, then you will never finish your presentation. Not to mention you might come across as insecure. Practice these three approaches until they become second nature. Your brain habitually interprets audience behavior negatively, and you have to train it to be balanced, not to indulge in interpretations, or to at least check before freaking out. Don’t overuse any of the three, balance them out. There are three more advanced strategies that I use to help me keep my public speaking fear at bay. I will be posting those in another blog soon. Once you have this down, you will be able to neutralize your public speaking anxiety on the spot before it creeps up and takes over your body. If you know strategies that work for you other than picturing your audience in their underwear, please share them below, that will be very helpful to so many other professionals.